This lovely home set in the rolling hills, surrounded by trees and the creek was not so pretty on August 10, 1861. The Ray family, busy going about their business, would find that life changed in an instant and was never the same. As with many families, the Civil War was literally fought on their doorstep. This battlefield has changed over the years and trees have grown where the corn fields once stood. The highway that ran in front of the house is now a dirt road preserved for all time. However, in 1861 it was a well traveled road, not only for stage coaches but also for the Pony Express that stopped at the Ray house. The family was doing well and quite comfortable. While the other houses were leveled with the barrage of cannon balls, this house remained basically unscathed. There is a cannon ball hole or two but when it became the hospital, at least the shelling stopped. 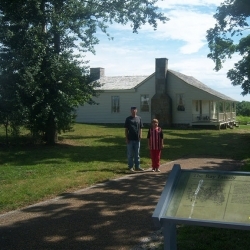 My son and grandson are standing in front of the house and shown through several of the other photos taken on our tour of the Battlefield. John Ray, his wife Roxanna built the house in 1852 and raised 9 children. The house is the only one still standing. 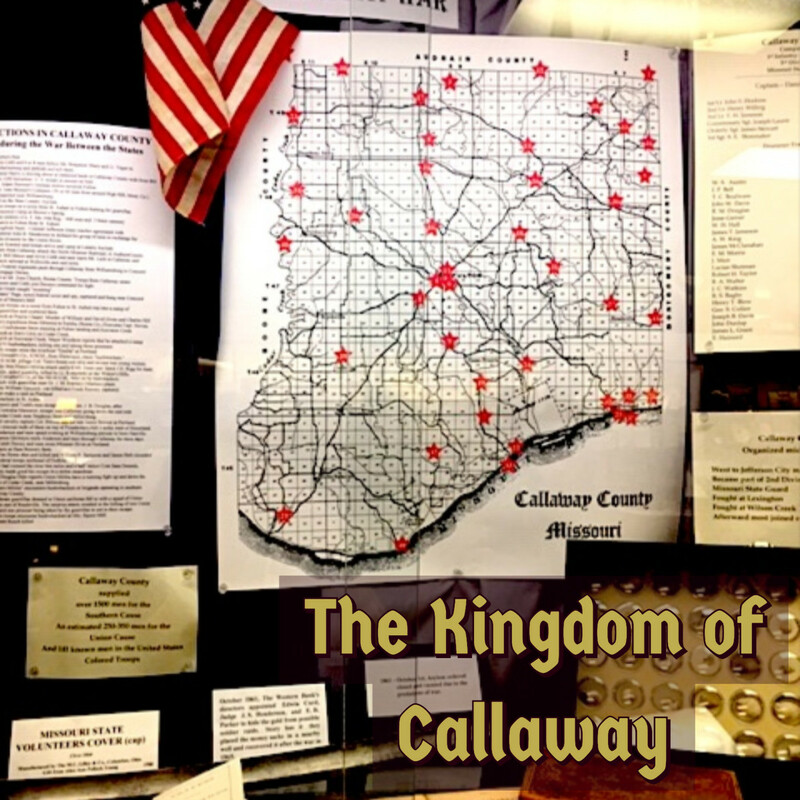 John Ray watched the battle from his front porch while his wife, children, and the help hid in the cellar. When the shelling stopped, the family came out of hiding to find the house, yard and fields full of dying Southerners. 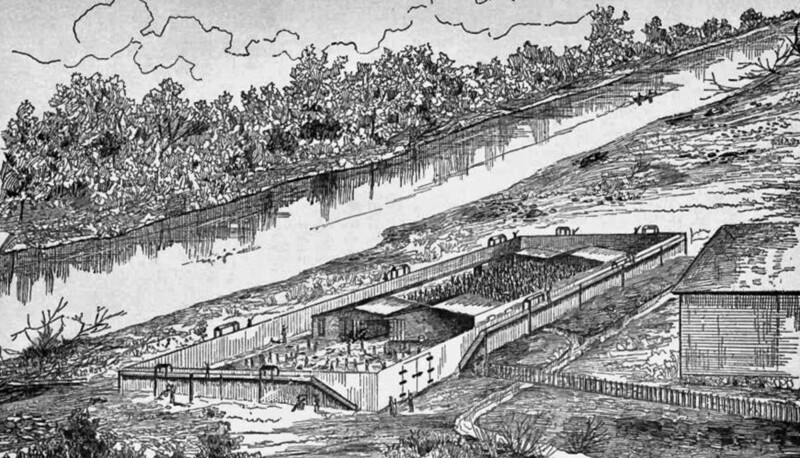 This assault on the pro-Union troops was originally planned following a dispute in St. Louis between General Lyon and Governor Jackson, the Missouri Governor who was pro-Confederate. 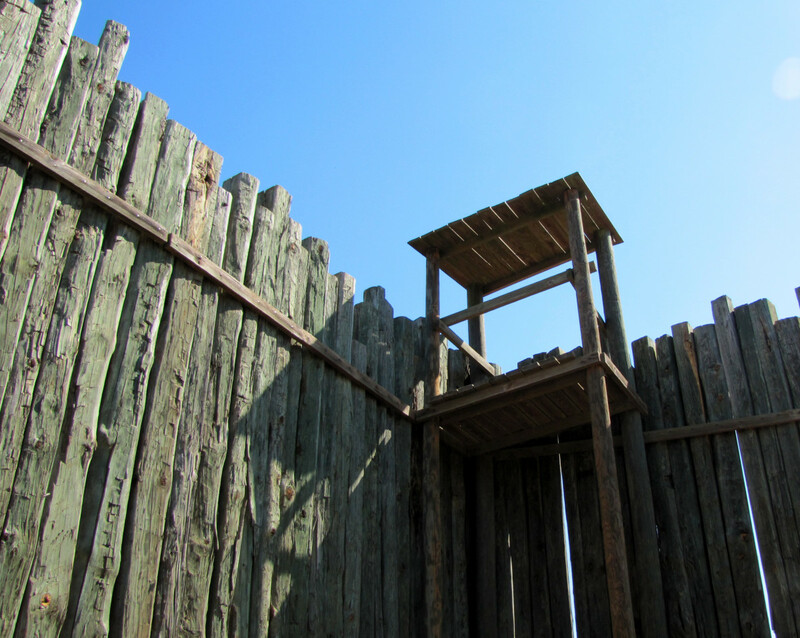 Lyon and Jackson had already battled over the armory in St. Louis. The battle lasted for more than five hours and ended with a Confederate win. For the Ray family, the battle was just beginning. The Confederate Army took their livestock and stored food. The fields that the battle was fought on were destroyed and the family was left destitute. Even the Pony Express Route that had helped provide an adequate income was gone and they never really recovered. They were fortunate that the house survived as all the neighboring homes were destroyed. General Lyon was killed during the battle. 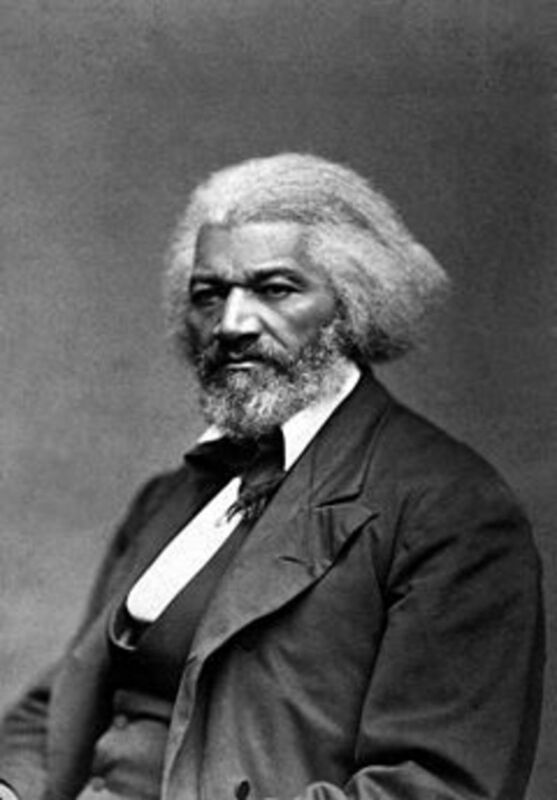 Although he lost his life, he achieved his goal to keep Missouri under Union control. The Ray children must have stood on the porch just as my grandson Niles and grandnephew Sean did for this picture. Before the war, this was where the Ray children played. 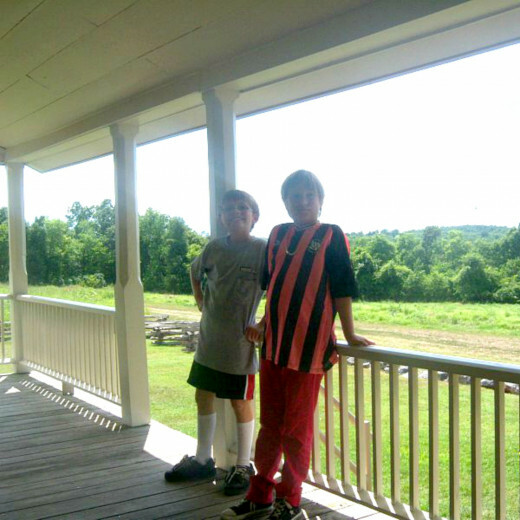 It is hard not to contrast the carefree children standing on the porch in 2011 with the 9 children who played on the same porch in 1861. Our children have not been touched by war on our soil but the Ray children saw life change for them in an instant. 150 years later, we can visit this site but cannot imagine the horror that it must have been for the children to see the wounded men dying there. We all take something away from these sites. In Gettysburg I was struck with the tremendous loss of life from the three days of the battle. Here, it was about the children. Our kids can study the history and the reasons for the war but for me, it was the sadness for the Ray children who learned much too early about the tragedy that war brings to all. Bloody Hill was the second battle of the Civil War. In the cornfields outside of Springfield, this battle was a deciding factor in the direction taken by Missouri. Today it is a parking lot to stop to check out the cannons. In 1861, there were no trees and there were acres of corn fields. This is where the battle was waged. It is called Bloody Hill. I was not aware of the Kosciusko neighborhood in St. Louis, Missouri, when we visited Wilson's Creek. Although I have been to the Arch in St. Louis, I had no idea this neighborhood, sitting in the shadow of the Arch was historically significant in the Wilson's Creek Battle that defined the role of Missouri in the Civil War. It's a story in itself and one worth researching. Missouri hoped to remain neutral during the Civil War but there were events swirling around them that made the impossible. Important read for anyone interested in the War. We missed the reenactment because our vacation was over and we had to go home but this photo was taken by my son as a participant. It almost seems real. For homeschoolers, ask at the desk for the learning packet. It is a very detailed guide on the battle and the events that lead up to it. School tours are automatically given the packet but it is also available to homeschooled children. The National Parks guide on Wilson's Creek. In the Wilson's Creek Battle, the soldiers did not wear uniforms as the battle was the second of the war. Much of my family is in Springfield, Missouri. 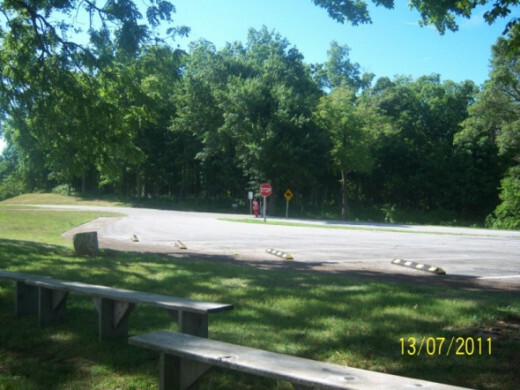 Wilson's Creek Battlefield is where they play and ride horses on the designated trails. 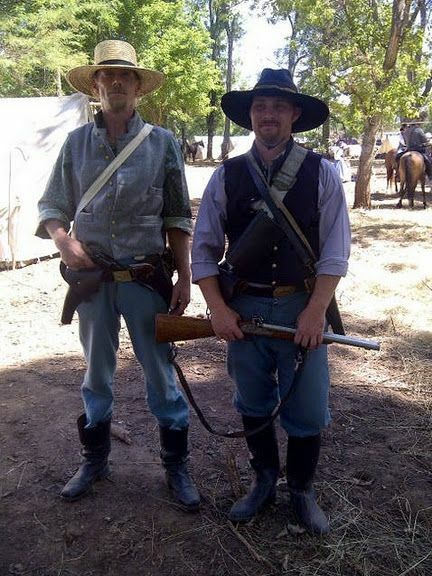 As you can see from the photo's, they were also a part of the 150th anniversary reenactment. My niece was married there in 2000, dressed in full costume and rode in on horseback. The area is incredibly beautiful and today so peaceful it is hard to believe that on that day about 1200 lives were lost on both sides. Time has repaired the landscape and hopefully, the souls that fought so hard for what the believed, regardless of the side they supported. Great lens. 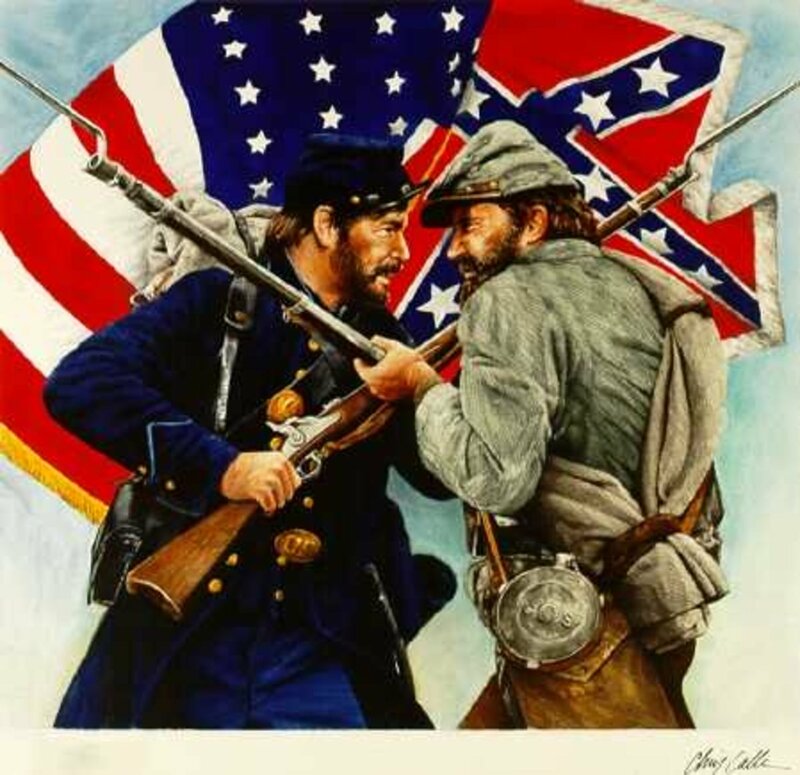 Too often the Civil War gets short changed when it is taught; boiled down to its absolute barest components and glossed over as quickly as possible in the rush to close out the first segment of US history. Truly a great loss to every student in the country. Very interesting! I love the photos you've included here. A very impressive presentation of the Wilson's Creek Battlefield and how rich that your son and nephew where on active duty for the reenactment...those pictures do look too real, I got that sinking feeling looking at the battle in action. Wonderfully done and blessed. A really nice history lens. Thank you for the information. I was not familiar with that battle. So many lives lost. what a great history lens! Thanks for posting nice lens! I love these kind of activities. Better than role playing, one can learn a LOT just by participating. Excellent page! We get to Springfield a few times a year. Will have to check the battlefield out. Great information about the Wilson Creek Battlefield. I don't live in an area with any civil war battlefields but try to visit as many as I can when occasionally traveling to areas where they are located. 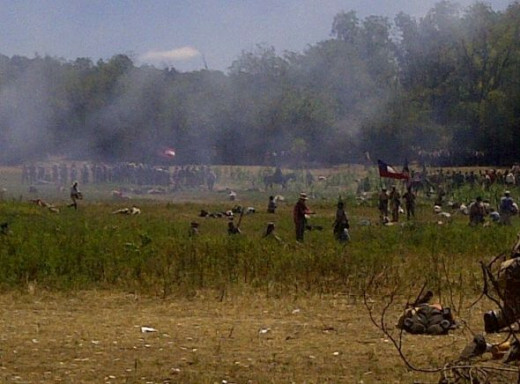 I would love to see a re-enactment at one of the battlefields some day. Great job on the lens. I am on a mission today to find civil war lenses and yours is the best so far. I've been to Missouri and am aware of the rich historical heritage. This is an amazing lens. Thank you. It's hard to imaging being such a close spectator of the Civil War. Congrats on making the top 100! Reminded me of a trip we had tracing the First World War in Europe. It was sad. Nice historu lesson. Congratulations on being one of the final 100 favorite Squidoo lenses of 2011! You are in my neck of the woods here! I have visited the battlefield and studied it's history. I enjoyed reading about Wilson's Creek Battlefield. We have reenactments here and they are so interesting. Congrats on being in the Top 100 Community Favorites. Wonderful lens. My wife and I talk about visiting some of the southern Civil War battlefields but we haven't seen anything south of Antietam except for Fort Sumter. If we ever make that long-anticipated road trip I think Wilson's Creek will definitely be part of the itinerary. A pivotal battle missed by many. Nicely done. WOW!! GREAT lens!! :0) American History Is Cool! Congratulations on your purple star ~ it's well deserved! enjoyed your article this morning. It is sometimes hard to find a lens with original content, with their own photos and especially their own story. I just recently was award a purple star award and have an opportunity to nominate someone else, you've got my nominee! Keep up the good work, I'll look forward to stopping and viewing other lens from you. Wow, very educational, and great pictures. A sad day in American history. 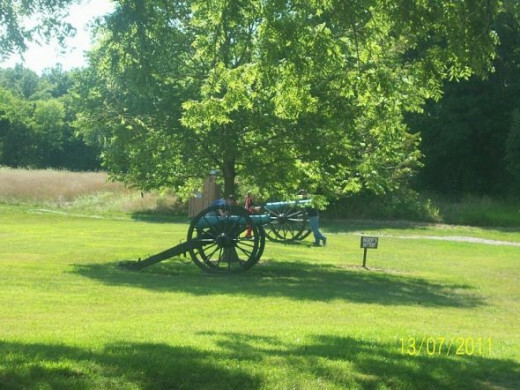 Thanks for sharing your photos and knowledge about the Wilson Creek Battlefield. 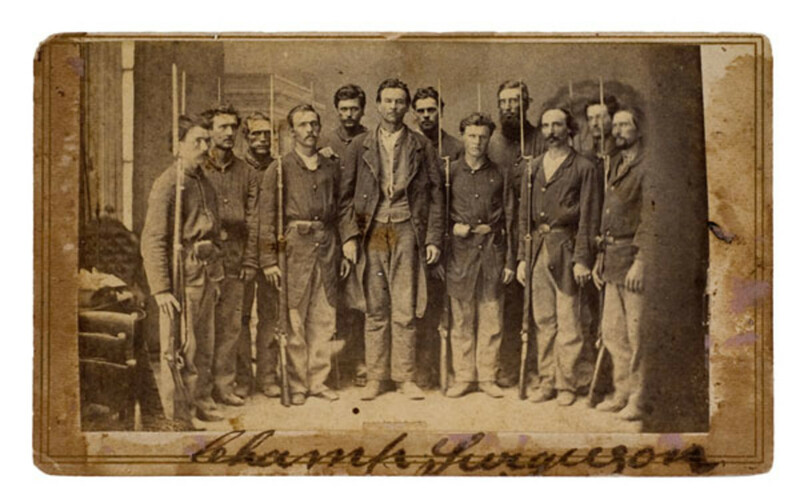 Having grown up in Kansas, I read in school about the border struggles between Kansas and Missouri becoming states and the pre-Civil War skirmishing. I hadn't heard of this one though. The new photos are a great addition! They make it so personal. And real history! The map is helpful, also. What a loss. War is a nightmare. Thanks for bringing this piece of history to life for me! Really interesting lens. Great work! I lived near there when I was in high school and my brother lives near there now. Nice photos with your story. How about adding a Google Map to this lens?